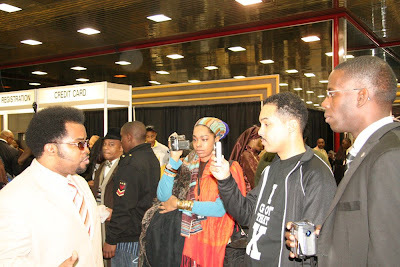 If you have been following my blog over the last several days, you know I was one of the many thousands in attendance at the Saviours' Day 2009 convention in Rosemont, Illinois. Not only did I enjoy all of the events but I also saw it as a great opportunity to network! That word networking is sometimes used freely by people who are really not doing it. Don't get me wrong, when you're at a conference such as that one, with people everywhere, it can get tiresome but that's only if you see it as a task versus a joy. In the midst of me covering 4-6 workshops at a time each day for The Final Call, taking hundreds of photos, doing video interviews, updating my social networking sites and conducting live blogging, I was able to make connections with a lot of people! But it all goes for naught if we don't follow up! 1. Put in work BEFORE the conference: Over the last year I have been working hard to increase the traffic and readership for my blog. Hence, when I got to Saviours' Day many attendees already knew my face from reading it and they knew my name from my articles in The Final Call Newspaper. Note! I'm not a big advocate of just handing out cards just for the sake of doing it but this tactic helped because before I could say to a person "My name is Jesse..." they would cut me off and say "Hey, I just picked up your card when I got some water!". That sparked conversation. 5. Interviewed panelists and attendees: There is nothing like making a friend by asking them for a quote. I have so much video footage that it will take weeks to edit and upload it! 6. Followed up during conference: Since I had my cell phone with me all the time I would sit and send follow up emails to people I had just met to thank them for the brief talk and mentioned in the email some of the things we discussed. I also sent emails when I went to my laptop in the FCN room. 8. Live Blogging: During the March 1st keynote address by Minister Farrakhan, I conducted my first ever live blogging session with www.coveritlive.com. I was able to dialogue with people during the message in real-time! You can see the archive at Brother Jesse's First Live Blog. 9. Followed up some more when I got home: More emails were sent, wrote messages on Facebook walls, sent Twitter messages and emailed out blog posts that featured certain people I met. My number of blog subscribers increased too. I really needed this one...I am heading to a conference next week! Well said, Brother Jesse. Well said! First thought that comes to mind is 'WOW' and I thought I was doing good just wearing my MGT garments and a smile. Seriously though, I found this to be very informative. I could have used this prior to my workshop "Universality of God." Inshallah, there will be others. Thank you Brother Jesse. I hate networking in my profession, but I may try it in other circles. You make it not sound like "work", so Good article! I nominated you to receive an award for your blogging effort during the SD lecture.You held up under pressure brotha, Thanks :). I will have to try some of those techniques at the next opportunity. I can say, I have never seen one person do so much at one time. Like the brother said, you make me tired watching you!